GB pig feed production in 2017 totalled 1.8 million tonnes, a modest 0.3% increase year-on-year, according to the latest Defra dataset. The main driver behind this increase was growth in early grower feed (+15%), despite this coming from a low base. This more than compensated for a 2% annual decline in breeding feed production. For the month of December GB pig feed production was up on the month for the third consecutive month. When comparing to the same period in 2016, pig feed production in December was 3.7% above, totalling174,500 tonnes. A 4% rise in pig finishing feed output, coupled to strong growth for the smaller growing and early grower feed categories, supported this rise. This supports the expectation that slaughterings will continue to be above year earlier levels, at least in the short term. Conversely, breeding feed production during December was almost 1% lower than year earlier levels. The production of pig feed in GB displayed a similar pattern to pig meat production. 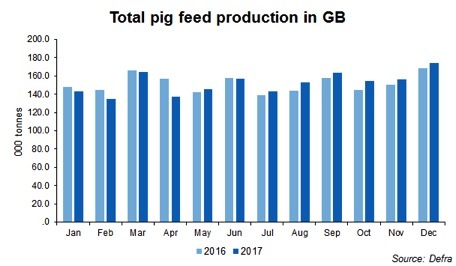 For the first half of 2017 both GB pig meat and pig feed production averaged a 4% decrease year-on-year, However, during the second half of the year, total pig feed production and pig meat production recorded some uplift when compared to the previous year. Cumulatively, there was relative stability in pig feed production, however pig production was down around 1% on the year. In terms of cereals used in total GB annual feed production for 2017, barley usage rose by 20% on the year to 1.2 million tonnes and wheat inclusions increased by 1.3% to 4.7 million tonnes. Oat usage increased by 3.7% to 46,000 tonnes and maize increased 4.3% totalling 333,000 tonnes.